Welcome to the Olney Model Railway Club Website. The club, founded on the 25th February 1993, is small and friendly and currently has a membership of 16. We are seeking more new members of any level of skill and experience, from beginners to experts, to assist in building the layouts, or just to run their trains on a much larger track than most people have available at home. The site is divided into ten sections, with a navigation bar at the top of each page. There is also a repeat of the navigation aid in the left hand margin. A section has been added, called Articles. The first article is called "Electrics and Model Railways" and is a beginner's guide to wiring a model railway. A further section called Olney Station Project has been included. We will add to the page as the project takes shape. To accompany the new page Barrie has written an in depth article on the history of the Northampton to Bedford Railway (added to in March 2016). A second article has been added to the page, describing a special passenger train journey along the line in the summer of 1951. The latest page to be added is the Club History page, describing the early years of the club, with part three added to include up to 2010. At the AGM it was agreed that subs would go up to £2.50 per visit and the annual fee would be £30.00. The meeting last night (Thursday) was well attended with the usual tea/coffee and biscuits. This week we were working on the new N gauge layout using the Market Cross baseboard. A plan has been hatched and marking out the track was started. Tidying up the wiring continued on board three of the Olney station and yards. The station platforms and scenery were also being revamped on the Olney Station layout. The circular test tracks were again in use with members running new and second hand locomotives and trains. Thanks to Peter for writing the Phonebox Magazine article regarding the exhibition and taking photographs of the event. I shall be able to publish some Photographs of the last exhibition soon. Alan B has kindly donated some locomotives and rolling stock for use on the layout. Chris has fitted DCC decoders to the two car Diesel Multiple Unit and a 0-6-0 3F tender engine, which were run on the layout. Peter has provided some photographs of the exhibition 2017, which are now on that exhibition page. The bus wiring on the two OO gauge test tracks and the O gauge tracks have been completed. Wire connections have been made to all sections of track (except the points) using droppers and bus cable. Loco running is much smoother as we are not relying on the track and rail joiners to provide all the power. One of the 00 gauge track circuits has a switch fitted to allow DC or DCC controllers to be connected. Many thanks to Chris for all his efforts. The annual club dinner was held on Thursday evening 14 June 2018, again at Donzella's restaurant in Olney. We all had a very pleasant meal and enjoyed the evening. Alan, the chairman, gave a short address before the start of the meal thanking all the members for their hard work during the last year. Many thanks to Malcolm for organising the meal and also to the staff of Donzella for making the evening a success. You have probably seen it already, but Olney and District Historical Society have an article about the Northampton - Olney - Bedford line, which may be of interest for the Olney Station project. If anyone doing research into the Olney line, would let me know the web sources or any other details, as we progress, I will put them on the Olney station project page. Thank you for passing on more of Alan's photographs, which are now on the Olney station project page. The new style web page is up and running, as you can see. Hope you like the look of it. Most of the old pages have been replaced by a diversion page on to the new website in case they have been bookmarked, or accessed via Google or other search engines. P.S. 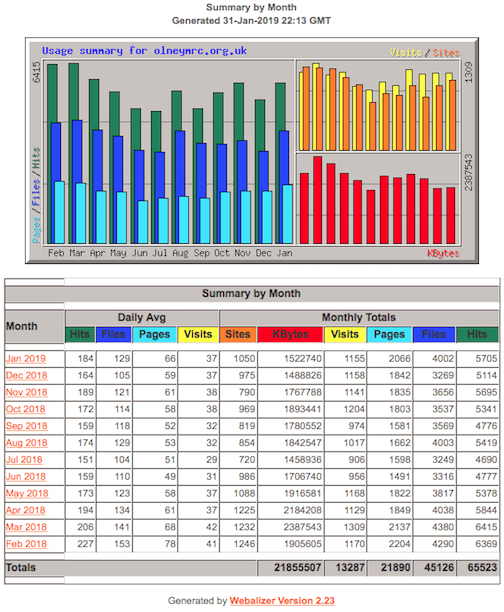 I have included, because of popular demand, a table of the site statistics for the year to date (31 January 2019). We are unable to update the statistics at present. The next Club meeting will be held on Thursday 11 April 2019, starting at 7.30pm. Full details can be found by clicking Club Night.